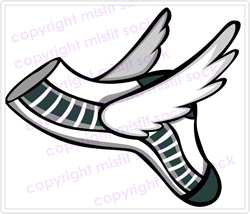 One of the offshoots of the Million Misfit Sock March is a project called Sock Angels. Through this program lonely and marginalized socks can become gifts of JOY for those in need and YOU become an angel for making that happen. From October 26 through November 21, you bring in a single sock to be hung in the Circulation Desk area. Your sock can come empty for others to fill or can come filled with items. If you prefer to bring in items without a sock we will use those to fill empty socks. The library will then deliver filled socks to the Haven in time for Thanksgiving. Donated items for kids or adults can be for self-care (for personal hygiene or small clothing items – e.g. new socks) or for enjoyment (small toys or books, pencil sets, fun pens, etc.) or gift cards which address either need. If you have questions, comments or suggestions please contact Lisa or Beth.